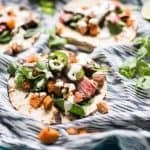 Marinated in fresh cilantro, lime, garlic and pineapple for the perfect blend of flavors, Cilantro Lime Flank Steak Tacos cook up ridiculously quick and easy, with a simple jalapeño crema sauce that can be made in the blender or food processor. Combine all ingredients in a food processor. Pulse 3 to 4 times, then blend for 30 to 60 seconds until garlic and cilantro are finely chopped. Remove the flank steak from the packaging and pat dry. In an air tight container, like a ziplock bag or Tupperware container, cover the flank steak with the marinade. Let sit refrigerated for at least 8 hours or up to 2 days. Combine the jalapeños, garlic and sour cream in a food processor or blender and puree until smooth. Jalapeño crema will stay fresh for up to 4 days in an air tight container. Preheat oven to 425°F. If leaving skins on, wash potatoes thoroughly or peel the skins. Cut sweet potatoes into a small dice, about 1/4″ to 1/2″ pieces. You’ll want them on the smaller side so the sweet potato pieces fit in the taco shell. On a large sheet pan, coat the diced sweet potato with olive oil, salt and pepper. Roast for 30-35 minutes, stirring halfway through and then again about 10 minutes before they’re done. Cook the flank steak: Let the cilantro lime flank steak sit at room temperature for 20 to 30 minutes before cooking. Heat a large cast iron skillet or grill pan over high heat until hot – about 3 to 5 minutes. Coat the pan with 2 tablespoons olive oil. Carefully place flank steak flat in pan, as some of the marinade may sizzle when coming into contact with the hot oil. Cook on each side for 4 minutes,¹ only touching the flank steak to flip in the pan. After cooking the opposite side, remove from the pan and place on a cutting board to rest for 10 minutes before slicing. Once the Cilantro Lime Flank Steak is rested, slice the steak in half length wise, so that the final pieces are not so long. Cut the two portions of steak into thin 1/4″ slices. Prepare the tacos: Warm the tortillas. If you have a gas stove top, taco shells can be warmed over low heat on each side, right on the burner. Do NOT try this with an electric range. Alternatively, tortillas can be warmed in a pan on the stove top over medium heat or in the oven wrapped in a damp kitchen towel. Layer each taco with a few leaves of baby spinach, top with cilantro lime flank steak, crispy roasted sweet potatoes and drizzle with jalapeño crema. Serve immediately. ¹Most cuts of flank steak are uneven in thickness. Cooking 4 minutes per side in a hot pan will provide a medium rare center on the thickest part and medium well center on the thinner parts of the cut. Add a minute to each side to increase the final temperature.